On damp weekends in the UK on occasion we used to take comfort in one of our favourite home stores. Not only could I salivate over tiles, paints and bathrooms I could dream about owning the Rolls Royce of cookers – an Aga. I fantasised about baking bread, cakes and casseroles. I have to confess that when we were building our house here in New Zealand I had mailed over a copy of the Fired Earth catalogue and lugged around paint stores, tiles shops and bathroom shops pointing at the pictures and saying “I want something like that!”. Remarkably many of the retailers took pity on me and consoled me with the next best thing available in the southern hemisphere. I admit we did contemplate an Aga when I tracked down the New Zealand distributor but common sense got the better of me in our determination to keep the building budget on track. I feel that one day I may yet become an Aga owner but for the time being I love my Aga cousin a Rangemaster Range which is no compromise I can assure you. It’s an old friend these days as I flex my domestic executive muscle. Somehow though I’ve always felt a bit of a domestic fraud. With amazing kit to cook and bake with and more time than ever to experiment I’ve still failed to bake bread in the traditional artisan way. Using the breadmaker seems such a cop out but when you get great bread with little effort I’ve never had the compulsion to go the extra mile and bake bread with my own hands. Until now. Inspired by one of my favourite food bloggers I set aside my lazy tendencies and dug out our copy of the Hugh Fearnley-Whittinstall book – Rivercottage Everyday determined to try baking one of my favourite types of bread. 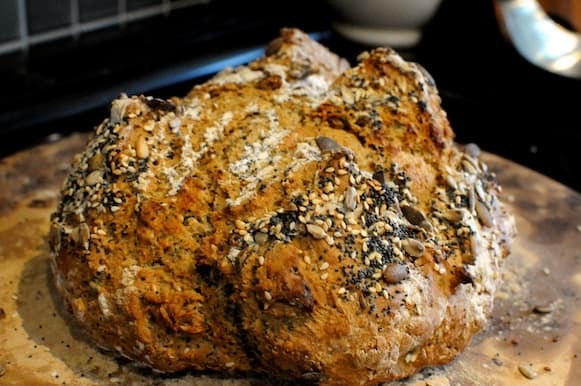 I first tried soda bread in Southern Ireland and it’s the perfect combination with soup and makes amazing toast. As luck would have it MT had bought some Buttermilk – just in case of what I know not – but I didn’t care for once I could turn my early morning food blogging inspiration into a reality within hours. In truth I’ve still copped out of the full blown bread baking experience. Making this bread is ridiculously easy and I’m kicking myself that I haven’t got my act together before now. 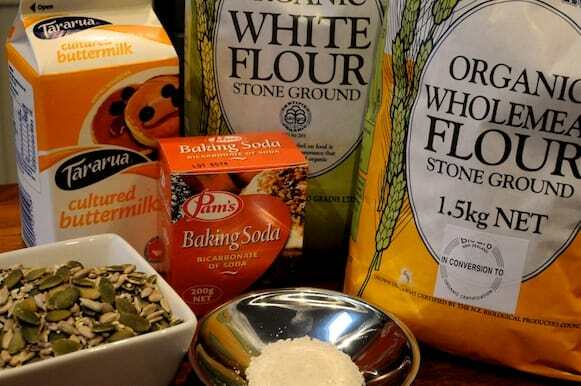 I’ll be adding Buttermilk to my regular shopping list now to make sure I have the necessary ingredients in stock to be able to enjoy a soda bread loaf. No real kneeding or rising so you can get almost instant bread gratification, with or without an Aga. I’m looking forward to perfecting this recipe over and over again. With winter upon us I’ll be able to rustle up a loaf in no time to accompany one of the many soups I serve up using vegetables from the garden. 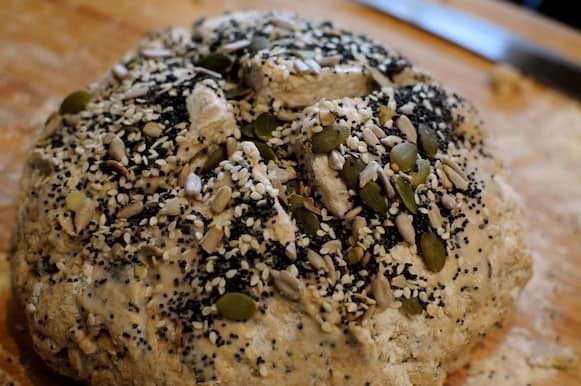 If you’re a break making virgin or like me have a bit of a mental block about bread making I thoroughly recommend you try out this recipe as soon as you can. Although my bread making lacks a little finesse right now I was delighted in my first soda bread loaf. What it lacked in presentation it made up in flavour. Given the choice of looks over taste I’ll go with flavour any day. Having taken the bread making plunge I’m determined to give more loaves a go. It will have to wait for warmer weather though as we have no airing cupboard nor an Aga to pop your baking dough in to rise and temperatures are a little on the chilly side right now. For the moment I’m going to enjoy this dense yet tasty loaf. 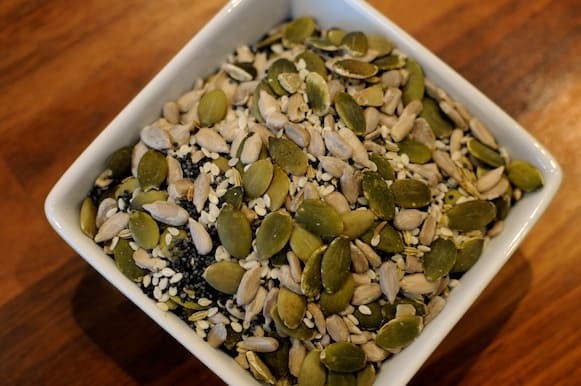 I know that Gluten free readers of this blog may have already disappeared onto their next blog (Hi Helen!). Shame really as they really are missing out on one of life’s luxuries and great bread is something I’d find hard to give up. I may not have the Aga but I feel blessed to be living out my dreams of domestication. All I need now is to get lost of practice with my bread making in so I can show off when my in-laws come to visit later in the year. 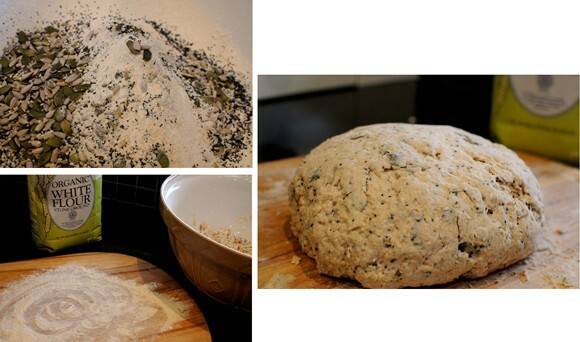 In the days when I used to eat bread – I loved making my own. My Favorite was Roman Army Bread using Doves Farm Spelt flour. If I recall correctly it had a touch of honey in it. It made a really strong flavored loaf – quite nutty. 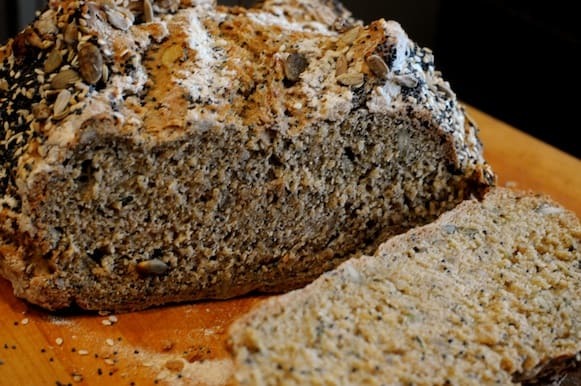 Absolutely delicious, and if you are thinking of getting into bread making – and if you can get Spelt Flour in NZ – I think you’ll like this one.